Last month, I shared images of the inspiration cards that were given to me when I was working and studying at Best Friends Animal Sanctuary in Utah. Tonight I share an inspiration of a different kind. Elesha, who was mum to Kenny who passed away in April 2016, contacted me because she had found these photos on her Instagram page. She thought I’d like them (I do!). Looking at these photos, I realise how much time has passed since I worked with Kenny. My practice has been re-branded from Canine Catering to The Balanced Dog. 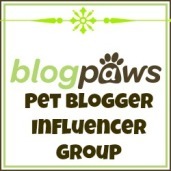 I have new shirts with a new logo and even our dog treat labels have changed. Progress. But the inspiration is knowing that the work I did with Kenny is still appreciated, and that Elesha stays in touch. Kenny was a great dog and I’m lucky to have worked with him and his family. Just thought I would send you a quick message! I hope all is going well on your holiday. Kenny is doing as well as can be. He has had 2 panting episodes over the past week, one was all day Saturday and one started in the evening on Tuesday and lasted a few hours. We popped the thunder shirt on him which did seem to calm him a little. He sends his love and wanted to tell you he is loving the sun and warm weather we have been getting here and he even had a bath the other day which felt amazing! 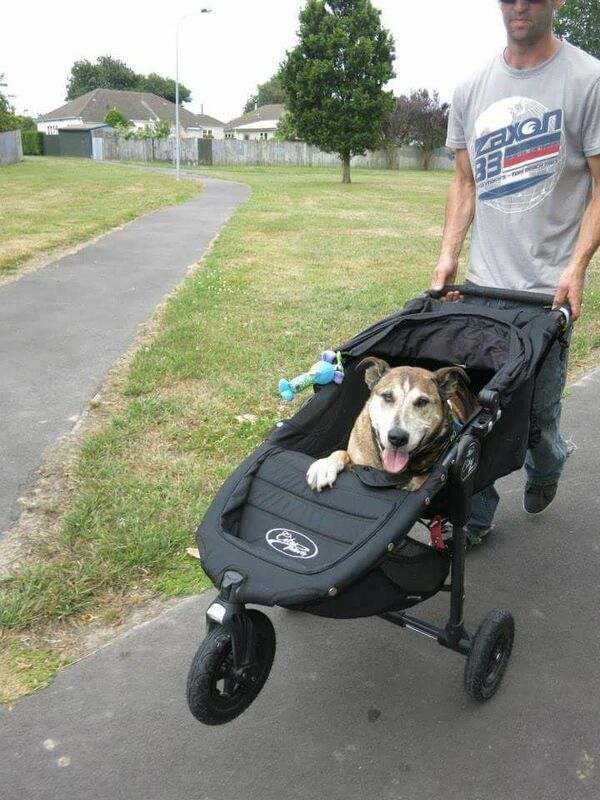 Dogs in strollers: real men do it! I’m so happy to be able to share these photos. Kenny is a Blue Heeler/Bull Terrier cross. 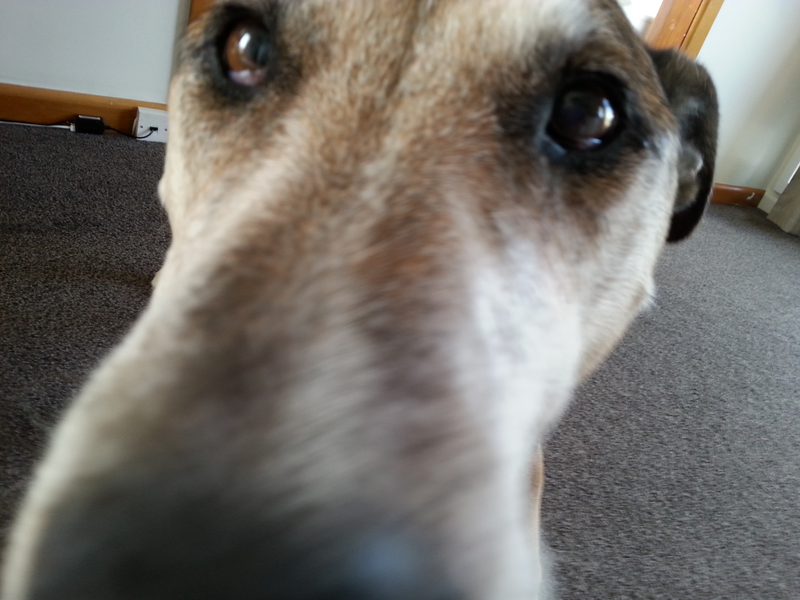 Now 12, he’s survived a car accident when a puppy and then a stroke in 2011. Not surprisingly, Kenny has a few mobility issues. His back gets sore and his left side is weaker. He gets regular massage and laser treatments from me which help to keep him more comfortable and mobile. 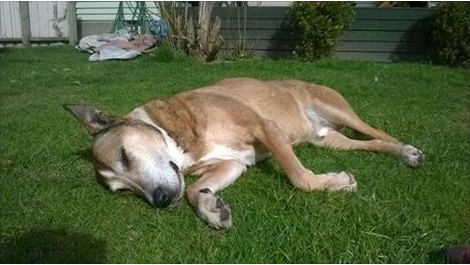 Like many other senior dogs with a few aches and pains, Kenny still wants to join his family when they go out. Sometimes he makes it into his favourite park but then struggles on the way back to the car. The solution, when Kenny gets tired, is to put him in a stroller. 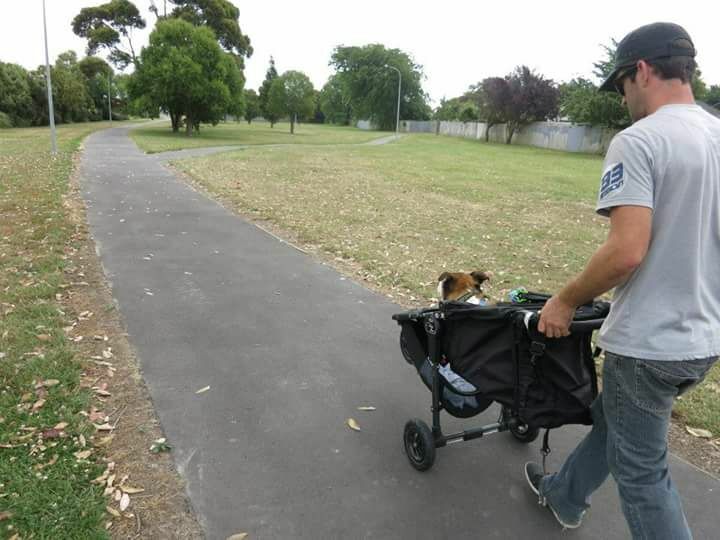 Many men seem reluctant to be seen walking their dog in a stroller. I say “Real men are happy to show that they care and love their dog”. All credit to Jason, Kenny’s dogfather. Dogs with mobility issues can live full and active lives with a little help. Kenny is far better off getting the mental stimulation of family outings than he is being left at home. Senior dog care requires management techniques; strollers and carts can play their part.